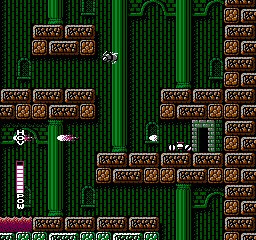 We saw a lot of legendary titles come out of the 8-bit era of gaming, but probably none quite as ahead of its time as Blaster Master. The game combined so many different gameplay ideas into one amazing adventure that offered up more playability than probably any other title of its kind at that time. There was platforming, exploration, and enough shooting action to keep even the most finicky game fan glued to the television screen. So how does this nearly 25 year old game hold up and is the game worth your hard-earned Wii Points? 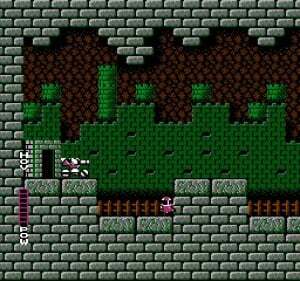 In Blaster Master, you take on the role of Jason. Your ultimate goal is to locate and destroy the boss in each area in order to receive a special power-up for your armored vehicle that will allow you to progress on to the next area in the game. 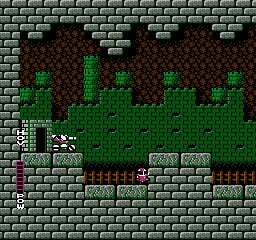 You can traverse each level in basically one of two different ways. The first way is by driving your armored vehicle around shooting everything in site. As you upgrade your vehicle with the special power-ups, you'll begin to have more freedom of movement at your disposal that can make traversing some of the trickier levels much easier. Of course there will be times when you reach a point in a level that cannot be accessed using your vehicle - this means you'll also have to do some moving around on foot. Once outside of the vehicle, you can enter the smaller areas of the game that change the perspective from a side view to an overhead view. Many of these are made up of tricky labyrinths that must be explored, not to mention many enemies that you'll have to blast into bits in order to survive. While your blaster will be your weapon of choice most of the time, you'll also have access to missiles and grenades as well. These will come in particularly handy when facing many of the game's extremely tough bosses, and there are plenty of them. 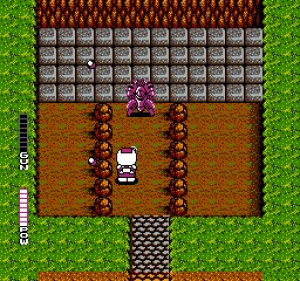 The play control in Blaster Master is extremely responsive and very easy and intuitive to use. Exploration plays the biggest role in the game and is what makes up the bulk of the challenge. It's also nice in the way the developers were able to craftily weave in the platforming and shooting areas of the game and when you toss in the amazing boss fights, you have a title that's absolutely chock full of playability and a game that's as much fun to play as it is challenging. 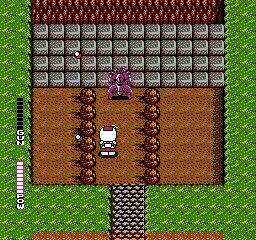 Visually, Blaster Master is pretty impressive for an 8-bit release. Each area features a very distinctive look and feel and there's certainly no shortage of variety when it comes to the many backdrops you'll be seeing throughout the game. Even the bosses are very well drawn and animate quite fluidly considering the humble hardware they were developed on. It's clear that the developers did their homework and put in the time it took to create a solid graphical presentation and it really paid off in the finished product; it's fair to say that this is one of the best-looking NES titles. Much like the visuals, the audio presentation in the game is brilliant. We saw a lot of amazing chip tune musical scores come out of the 8-bit era and Blaster Master is among the best of them. Most of the tracks are catchy up-tempo numbers that perfectly fit the action-packed intensity of the game. Even the sound effects are top notch and add in even more audio magic to the overall package. Let's just say that you'll likely find yourself humming these tunes long after you've put the game controller down. 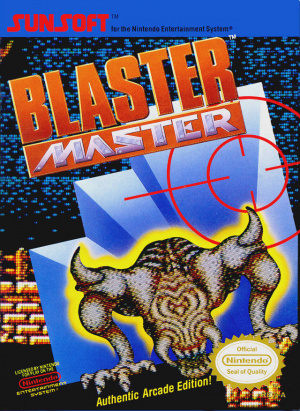 Blaster Master still stands as one of the true gems to come out of the 8-bit era of gaming. Its fantastic gameplay and thoroughly engaging quest make for one amazing video game experience. Sure, the game is a bit on the difficult side, but it's so good you'll want to keep coming back to it in order to beat it. It's easy to see why so many classic game fans still hold this title in such high regard and it's great to see Sunsoft bring it back for an entirely new generation to enjoy. If you've yet to experience Blaster Master then you owe it to yourself to give the game a try and at a mere 500 Wii Points, it's an absolute steal. I'd never heard of this game before! Thanks for the great review. You convinced me to get it when I get the chance. Glad to know it's a worthwhile journey. I definitely got the impression that it's an impressive game. Much like the above poster, before Sunsoft announced they were bringing this to the VC, I never knew this game existed. For shame! This game is brilliant. I picked it up last night and honestly I cannot believe the NES was capable of making a game that looks as good as this. Give it a broader colour pallet and it could almost be on a 16-bit system -- it's certainly up there with stuff you could find on the PC Engine. I thought it would just be another shooter, but mixing up the play styles was a welcome surprise. Definitely worth more than 500 points. Oh, and fixed that typo -- thanks KS8! I am not crazy about the level and enemy design, but the side-scrolling parts are excellent. Will withold judgement 'til I play more. It's a blasted masterpiece. A.....a.... Blasterpiece! Looks great, still don't know where I've heard of this game before, but it's on my radar. "I picked it up last night and honestly I cannot believe the NES was capable of making a game that looks as good as this." That's Sunsoft for you! They completely owned the NES. 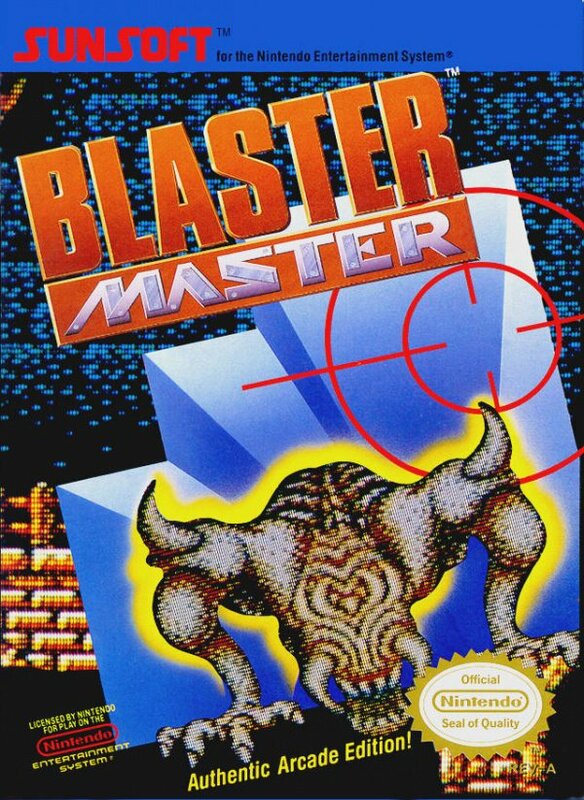 Blaster Master is one example of their awesomeness. Great review! Everyone who loves classic games needs to grab this one. Really wanna play this on Friday come on Nintendo EU! Been really wanting to play this since I saw http://www.youtube.com/watch?v=hTl1gTTOFNA heard it was coming out 14th and checked in the morning and found out it was the effing US release with no confirmed date for the UK. Superb title. At first, it seemed just like Mega Man, only with tanks. Well, I couldn't believe it when I saw my dude jump out of the tank (like Metal Warriors in SNES). I was especially astounded when he went indoors and the action switched to top-down view (like Pokemon on Gameboy). Graphics make it transcend the 8-bit system, a feat in itself, and sound is very complementary. Absolutely worth a shot for any gamer/nongamer. ok... now i want this too! Lol, I should get this just to make puns with my Username. But I'm seriosuly considering it, given the 9. Great review. I played and defeated this game when it was out in the 80's. Gives you a clue to my age. The music is still in my head. I can actually hum the 6th Ice Level ... Its really catchy and upbeat. Also, this game is really difficult and will take you a long time to defeat. One other thing I remember is coming back to an area with a new ability that allows you to get to an area you couldnt before. I highly recommend it only if you are in the mood for a difficult adventure with memorable tunes..
Yeah the music is ace, we really should have this in an NLFM broadcast. Love it. Bought the cartridge version for $5 last week. The intro music when your tank launches for the first time got me so pumped! I can still hear it playing in my head. I remember playing this game with my friend, swapping the controller back and forth occasionally, during summer vacation one year. I think we were something like 75-85% through the game when one of us accidentally bumped the NES and the game froze and refused to unfreeze!!! I remember loving this game but I don't know if I have it in me to go back to that game - I still feel cheated by all that wasted time. played this game online and LOVED it. can't wait to get some points so i can download it. I will be calling "Objection_Blaster" "Objection_Master," then. I remember this one. Definitely looks like a great buy. Can you save your data, or do you just have to use the Home Menu save? The first game I bought for my NES back in the 80's. Too hard for the kid me. I agree with JayArr, this game is indeed a Blasterpiece! Fantastic review Corbie. This game never seems to get old. It feels just as fresh as the very first day I played it when I was a kid. It really demonstrates what the NES was truly capable of. The graphics, the music and the gameplay; everything in this game is extremely well done. For only 500 points, you should definitely consider downloading this classic gem. Oh and the grenade trick still works! How is the Genesis sequel? Awesome review and totally earns the score it gets. @ Bass: I don't know anything about the genesis sequal but stay away from the playstation one. It didn't feel like a game in the series. For those who haven't played this game, DOWNLOAD IT!!! The game's awesome! Bass X0 the genesis version has the best color palet from any megadrive/genesis game. Great review Corbie, I already wanted to try this out, but after reading about it, I'm dying for playing it. @Bass X0. Apparently, not good. I think i should give it a go. needs to be played to be believed. I loved this back in the day, but it's quite hard. I eventually gave up because I didn't have time to get far enough in one sitting with no save options. Now thats all fixed, awesome. i remember my brother having this game when i was a tyke, it was fun even though i had no idea of what i was supposed to do. It sure IS a blast Corbie! Easily one of the best and most polished NES games I have ever played! I'm so glad I got it! Argh . . One of my all time favorite Nes games. Hope this will be released in EU soon . . This in my opinion is a must buy for VC. I always enjoyed this and would consider downloading it if I didn't have the Gameboy color version, which I think is the same. A good game. Which Gameboy one? Because both of them were spin-offs, but one was more like the original than the other(they're both different games, though, so I'd say it's more than woth it to get the VC one). This game is amazing: a true classic. Innovative, creative, challenging, in short well worth the money. A prime example of the glory days of the NES. Polished in every respect. A difficult challenge, but not impossible. Large, well-drawn sprites, rocking music. Definitely in my top-5 list of NES titles. Hm I think its a little overrated. I mean, the graphics and music are great, and its innovative for its time, but, there's a lot of flaws imo. There should've been a save system, or even a password system so you don't have to always replay from the beginning of the area whenever you run out of lives (which is surprisingly fast). Plus, the boss battles seem very cheap and while they are well-animated, they really frustrate you when you run out of lives and have to locate the SPECIFIC dungeon in the area to go back to the boss. 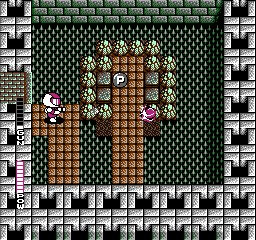 At least in StarTropics, the game automatically saves whenever you enter a dungeon. 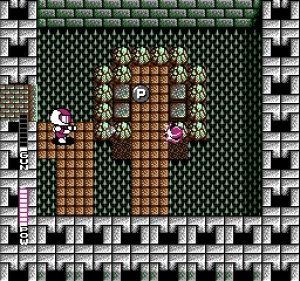 Mega Man 2 doesn't have a save system, but at least each level is short enough to not frustrate you in making you navigate tricky platforming sections before going to another area that you must navigate before fighting the boss. Just imagine your parents renting a game for you, sight unseen, popping it into your nes and then finding this. That's what happened to me and I've never stopped thanking my dad for getting this one. It was so good, before the rental was up we were at the store buying a copy. Awesome game. This is what a hidden gem really is. Have to agree with Qwikman on this one. As big an NES fan as I am and absolutely loving the Batman games Sunsoft made for it, Blaster Master to me just comes across as bland. Polished, but bland. Maybe it's because it's lacking the nostalgia factor for me, as I missed out on it back in the day, but so far its sterile graphics, boringly upbeat music and tedious top-down sections and, yeah, bland platforming hasn't struck my fancy. Clearly seems like a game that, while excellent at the time for being a technically accomplished, relatively free-roaming gaming hybrid, hasn't withstood the test of time with flying colours. Will keep playing it thought. You rated this WAY too high. Everyone should see how much better the Japanese version is.